Global land and sea temperatures lurched upward in March. Graphic courtesy of NOAA. April was active and changes are on the way in May. As the world warms month after month, the weather, as Alice would say, gets curiouser and curiouser. Let’s go Around The World. 175 nations formally signed the Paris Agreement, pledging to set standards for their parts in keeping global warming to 2°C above pre-industrial levels. This is an important symbolic step, but leaves much undone. 55 nations representing at least 55% of global greenhouse gas emissions must formally ratify the accord in order for it to take effect. US Secretary of State John Kerry opined that ratification could be done by the end of 2016, but most experts think it will take at least a year. Meanwhile, March was by far the hottest month ever and there are headwinds facing ratification, especially in the United States, where most Republicans reject the idea of man-made global warming; some have gone to court to stop implementation of the Obama Administration’s power plant emissions standards. The standards are now in limbo, pending appeals of lower court decisions. It’s easy for those of us in the northern hemisphere to forget that there are oceans down under (south of the equator) that can spawn tropical storms. Cyclone Fantala trekked through the South Indian Ocean, luckily skirting land, in the middle of April. At its most intense, Fantala had winds of 173 miles per hour, the highest ever registered in the Indian Ocean. Cyclone Fantala traversed the same stretch of water three times. Graphic courtesy of US Navy. Fantala’s path did the recent back-and-forth routes of several storms one better — back and forth and back again — first northwest off the coast of Madagascar, then back to the southeast, then northwest again. Fantala finally dissipated in the open ocean. Fantala’s demise was hastened by a feedback that affects stationary tropical cyclones or those that traverse the same waters over an extended period of time. As the high waves mix the deeper, colder water with surface water, the temperature of the surface water falls, lowering the potential energy available to the storm. The water temperature anomaly chart for the area clearly shows the swath of colder water. The water temperature anomaly map for April 25, 2016 clearly shows the cold water along Fantala’s path. Graphic courtesy of NOAA. And Speaking — Or Not Speaking — Of The Tropics …..
As the Atlantic hurricane season approaches, various authorities issue their forecasts. Colorado State University’s team and Accuweather have released theirs, with NOAA, Florida State, and others to follow. Henceforth, Decoded Science will decline to publish these forecasts or give them any comment. The reason is simple: The forecasts have little value and are a distraction. Sometimes they are right, sometimes wrong, but that’s not the point. They put emphasis in the wrong place. The number of tropical storms, hurricanes, even major hurricanes, in a given season is largely irrelevant to precautions citizens should be taking. The chance of any particular spot being hit by a hurricane in a given year is small, and in most cases tiny. In south Florida, the chance that a major hurricane will pass close enough to cause damage is about five per cent in any year. A forecast for a 60% greater number of hurricanes would still mean a rather small 8% chance of a hurricane hit at any individual point. And a forecast of 60% fewer storms than normal would imply a 2% chance — still not zero. So Decoded Science will pay no attention to the seasonal forecasts, which are poor and not improving, and concentrate on the danger when a storm forms or is about to form. Forecasts for developing and active hurricanes are improving all the time. And of course, we urge anyone in a place that could be affected by a hurricane to be prepared. In mid-April, weather conditions conspired to produce a snowstorm in the Rockies and a deluge in Texas; the two events were connected by a jet stream pattern known as an omega block. The name comes from the shape of an amplified trough-ridge-trough which roughly forms the Greek letter omega (Ω). This breakdown of the normal west-to-east movement of the jet stream brings weather systems to a crawl, as the high and low pressure systems simply spin in place. As a result, weather can persist for many days, and precipitation can add up. This weather map from November 9, 2014 shows an omega block in the jet stream like the one that brought record snow to the Rockies and rain to Texas in mid-April. Graphic courtesy of NOAA. In this case the low pressure stalled first on the eastern slopes of the Colorado and Wyoming Rockies, then near the Gulf coast of Texas. In the last few days, the pattern has stalled again, bringing record rains to the northern Gulf coast and flooding to Louisiana. The omega block is forecast to continue for several days, with the east coast becoming the area that receives the most precipitation, which occurs on the east side of a trough. The omega block that brought floods to the northern Gulf coast the last few days is forecast to move only to the east coast by three days from now. Forecast courtesy of NOAA. The east slopes of the central US Rocky mountains experience large swings in temperature and precipitation. Upslope winds from the southeast, carrying humid air that originated in the Gulf of Mexico, can produce heavy precipitation. West winds, their precipitation having been deposited on the west sides of the mountains, are dry. Temperatures also can fluctuate wildly: The mountains trap either the warm Gulf air or cold Canadian air, depending on the direction of the wind. Where the cold air is established in a thick enough layer, the warm air rides above it and snow falls. Due to the irregular terrain, snowfall amounts can be highly variable. In the mid-April storm, a foot fell in Denver and ten inches in Cheyenne, Wyoming, while Decoded Weather Watcher Darla Dollman, about half way between, reported only two inches. A few days before and a few days after the snow event, temperatures soared into the 70s. El Niño Is Definitely On The Way Out. Will La Niña Come In? The latest NOAA ENSO (El Niño Southern Oscillation) update not only notes the weakening of this El Niño, but issues a La Niña watch. Conditions are expected to rapidly change to neutral, and then very likely to La Niña by late summer. A strong La Niña, normally the descendent of a strong El Niño, is quite likely. 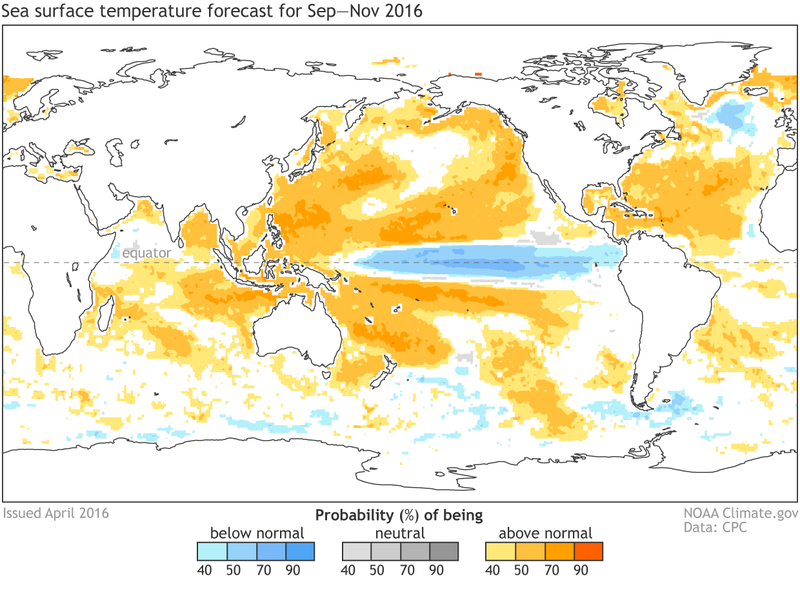 One of the more reliable forecasting models shows a strong La Niña for Sep-Nov 2016. Forecast courtesy of NOAA. Though surface temperatures remain elevated in the central Pacific, the warm water is in a thin layer; sub-surface water temperatures are well below normal over most of the Pacific, and this cold water has been working its way to the surface. The surface water of the eastern third of the tropical Pacific is now colder than normal. Most places experience summer and winter near the solstices, but India is different because of the monsoon. Summer begins in April and crests in May before the June rains begin. The last two summers have been particularly severe. Last year over 2,500 people died due to the heat, and this April temperatures reached triple digits and well beyond. El Niño is correlated with dry weather in India, and last summer’s rainfall fell about 15% below normal. Occasional showers normally restrict the April and May temperatures to livable levels, but those showers are sparse or absent this year. 2016 may see a long, hot Indian summer. The amount of carbon dioxide in the atmosphere on Mount Mauna Loa, Hawaii has grown 30% in the last 60 years. Graphic courtesy of NOAA. March was the warmest month on record in every category: global; northern and southern hemisphere; land, sea, and land and sea together. In April, atmospheric CO2 reached new modern age maxima on every time scale: monthly, weekly, daily, hourly. It’s no coincidence. Carbon dioxide traps heat in the atmosphere because it is transparent to the primary wavelengths of the sun’s radiation (in the visible range) and absorbs a fair amount of the earth’s radiation (in the microwave portion of the spectrum). Part of the spike in temperature can be attributed to El Niño, but the overall increase in temperature in the last 136 years (the period of reliable observations) is unprecedented in Earth’s history outside of cataclysmic events such as asteroid impacts or powerful volcanic eruptions. The next few months, as El Niño transitions to La Niña, will be critical indicators of how serious global warming is. Changes are taking place. Tell us what you see in your neck of the woods. Yardley, William . At U.N., 175 nations sign landmark accord on global warming. 'We are in a race against time'. http://touch.latimes.com/#section/-1/article/p2p-86754843/. The stalled snowstorm was a complete surprise to those of us east of I-25 in Colorado. We were prepared for a blizzard! Thanks for the update on the Climate Agreement!